I was just corresponding with a photographer about a family photo session, since Burrito and Tamale are about to turn 2 (!!!). I was giving some background on how to coax different family members to smile or cooperate. It seems that people are not allowed to say they’re photogenic. Most people think I am very photogenic, but a large part of that is that I am very skilled at selecting photos. If I’m sending out a photo that involves me, you’d better believe I will look good in it. Part of being photogenic seems to be that you look like yourself, and since I look like myself almost all of the time — and have genuinely not changed in over 20 years, just ask people at my high school (or elementary school!) reunion — I am therefore photogenic. Part of being photogenic also seems to be that you don’t make weird expressions. Having an unexpressive face, I’ve got that one down. My husband and son are both very expressive, facially and emotionally, and so they both get caught by the camera with weird expressions fairly often. So yes, I’m pretty photogenic — at least in the face, and the hair. My stomach, though, is wildly inconsistent on film. Thank goodness for cropping. Perfect Moment Mondays are back! My perfect moment started with a non-perfect moment, one that harkens back to a post in 2008 and another one in 2008 and another in 2009. 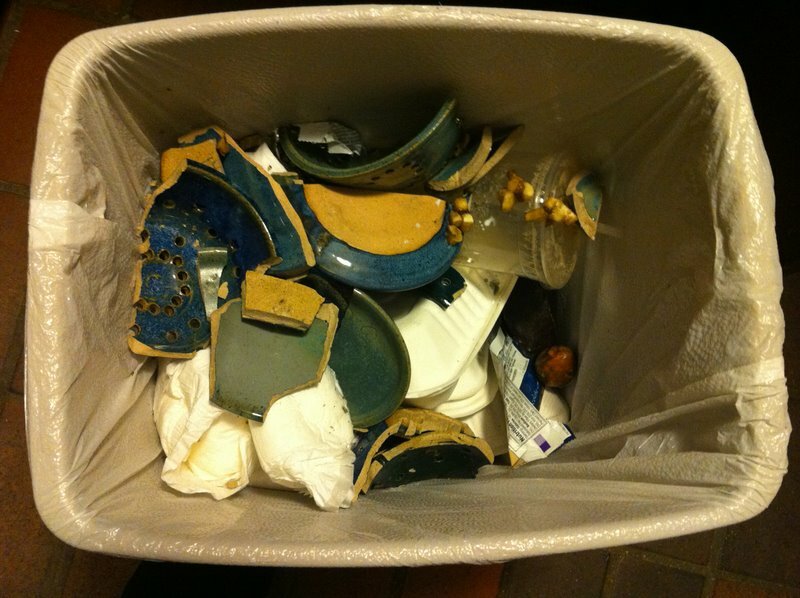 Pottery is a fragile endeavor, whether through my own error in the creation process, someone else’s error in the pottery studio, or a butterfingers accident at home. Before Burrito and Tamale were born, I’d reached a pleasant pottery homeostasis. 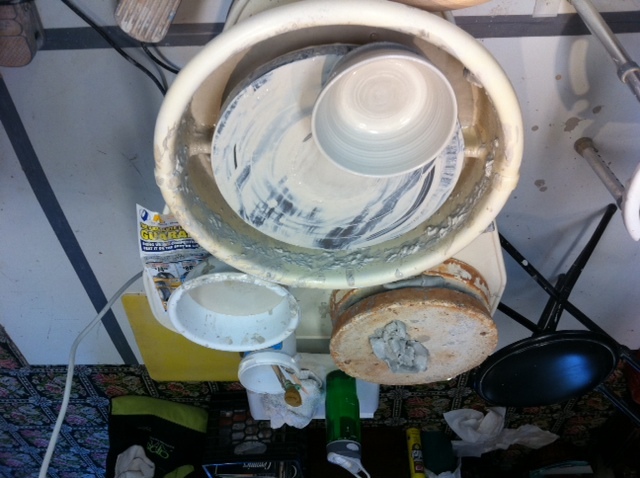 I’d made pretty much all of the projects I’d had in mind: a full set of dinner plates in three sizes, all sorts of bowls, cups, mugs, garlic pot, vases, even a couple of serving dishes. Then, a few months ago, I opened the kitchen cabinet, and every berry bowl I’ve ever made came crashing down. These demolished berry bowls had been some of my very best creations, and they were all gone. To make it even worse, I would have to live indefinitely without any berry bowls, because who knows when I’d get back into the pottery studio again. It would be years, right? Oh, how I missed you. Head over to Write Mind Open Heart for the triumphant return of Perfect Moment Mondays. Having had my house on the market for almost a full year, I’ve gotten used to the routine of preparing for a showing. Best case scenario is that the house is already tidy and clean, and a few things need to be staged. This has never happened. 2nd best case scenario is that the house is moderately messy and moderately dirty, and we must scramble to tidy and clean and stage. This has happened sometimes. 3rd best case scenario is that the house is a disaster area and we must scramble hard to tidy and clean and stage. This has been the most common. The tidying and cleaning are things that should be done anyway, and the house showing is a nice excuse to make them happen, just as we used to throw parties to force us to make the house presentable. I don’t consider this a waste of time. The staging is not stuff that needs to be done anyway. For example, I move furniture, hide all of the toys, and put back dangerous objects like fireplace implements to convert the living room from toddler paradise into adult living room. As soon as the showing is over, I have to put everything back. That room alone takes about an hour. 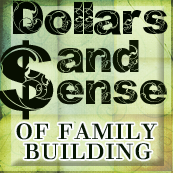 This is a waste of time in the sense that it does not need to be done for me, though I understand that it is the cost of doing business when selling a house. Then, there’s the stuff that may or may not need to be done, depending on who you ask, such as making the bed. We sometimes put the blanket and comforter back into position in the morning, sometimes not. If we don’t fix the blankets in the morning, we end up needing to do it at night before we get into bed, so it’s not really wasted time. The big time waster: decorative pillows. We never position the shams unless someone is coming over. DH has such disdain for shams. He openly mocks people like his stepmother who have a dozen decorative pillows on their bed, all of which must be displaced and replaced every single day. Do you make your bed every day? What’s your stance on decorative pillows? I don’t usually miss summer when it ends. This year, I miss it already. On the flip side, toddlers + adorable outerwear = hooray for fall! The last time the wind got knocked out of someone in this house, an infant Burrito kicked the nanny in the stomach during a diaper change. The last time the wind literally got knocked out of me, I was 7 years old in gymnastics class. The last time the wind figuratively got knocked out of me, I was in the car, last week. About a mile and a half from my house, there is a retirement home. I very rarely drive in that direction, so in 5 years I’ve probably passed it only half a dozen times. Aside from driving by, the only time I’ve ever heard it mentioned was last year, when the town parents’ group was organizing the children to visit the home for Halloween in their costumes to amuse the residents. I didn’t bring Burrito and Tamale, mainly because it seemed wrong that my mother should be in a similar assisted living facility thousands of miles away but that Burrito and Tamale would be oohed and aahed at in their costumes by other kids’ grandparents but not her. Sometime between last Halloween and now, the home, which was formerly independent, was bought by a national chain of assisted living facilities. The same chain that owned the facility where my mother spent most of the last year of her life. I didn’t know this until I drove by last week, when Burrito and Tamale started daycare on that side of town. When I saw the new sign with its too-familiar name, its too-familiar font, its too-familiar color scheme, I felt like I’d been punched in the gut. The wind got knocked out of me. I will be driving by several times a week now, so I suppose I’ll have to get used to it. So far, the punches haven’t been as hard and the wind is no longer being totally knocked out of me, but I’m torn between averting my eyes and stopping the car to stare at the sign. I have no idea if I’ll bring them there for the Halloween parade this year. When was the last time the wind got knocked out of you, literally or figuratively? Welcome to the September Intelligentsia, the people who have commented on every Thoughtful Thursday post in August. #20: A from Are You Kidding Me? This week we’ll talk about urgency. No, not the urinary urgency we talked about last week. Instead, we’ll talk about having a sense of time. Last week, some relatives visited. We had plans to go on an outing. I said that we’d leave at 10:00. As of 10:00, I was dressed and ready. Burrito and Tamale were dressed and ready (thanks to me, not their own desire to get ready, as evidenced by the moment when I was chasing an almost-naked toddler around the room trying to put on pants). There were three other adults in the house. At 10:00, one had showered but not finished getting dressed. One was in the shower. One was wearing pajamas, not having yet showered. I’ll admit, I can get too riled up against a deadline. In the face of true emergencies, like the car wreck that I narrowly avoided last week when a car in front of me on the highway suddenly hit the railing and flipped over, I am calm. If I’m trying to get out of the house to make a playdate, I become a lunatic. My mother wasn’t a big fan of words of wisdom, but there was one aphorism she used occasionally. When I really start flapping around like a chicken, I can hear her voice in my head: “Haste makes waste.” And then I breathe, and go about my activities a little more calmly. Our nanny is wonderful in many ways, and one of those is that she is laid back and calm even when two toddlers are screaming. But she also has no sense of urgency. When a toddler is freaking out, I go running; she finishes what she was doing or the conversation she was having. If I know that we need to leave at a certain time to take Burrito and Tamale to an appointment, I adjust meals and other activities accordingly; she just follows the regular schedule. I absolutely do miss important deadlines and certainly show up late much of the time (though the majority of my lateness is due to other adults, and most of the rest is due to toddler shenanigans). But even when I’m late, I know I’m late, and I fret about it. So many people around me not only don’t hurry, but don’t worry. How is your sense of urgency? When you need to go somewhere or meet a deadline, how much do you hurry? How much do you worry?